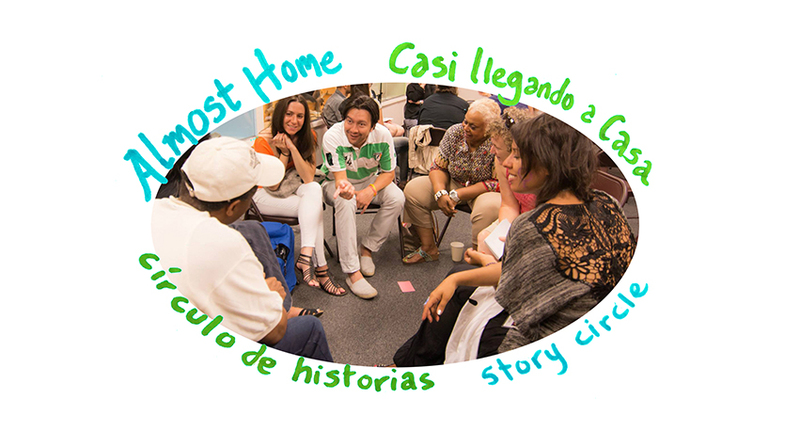 Almost Home/Casi Llegando a Casa is a storytelling, oral history, art, and video series in Jackson Heights, Elmhurst, and Corona that explores the meaning of “home” and addresses the struggle around gentrification, displacement, and immigrants’ rights. We presented story-sharing and art-making workshops in different locations from April-October 2017, and a culminating celebration in January 2018. Exploring the meaning of “home” through telling the powerful stories of the challenges our communities face, and inspiring victories that local organizers have won, Almost Home/Casi Llegando a Casa aims to strengthen community connections through public storytelling programs, participatory art installations, and video that examine themes of home, vulnerability, resilience, and resistance. 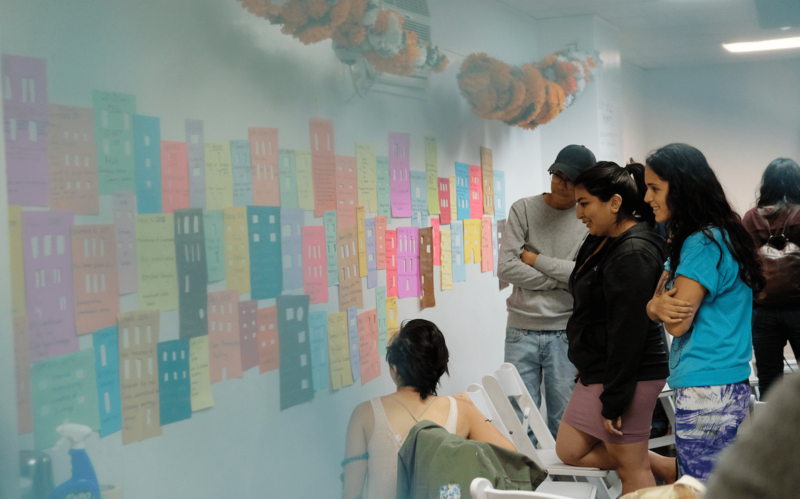 Through community-driven oral history, artwork and video, Almost Home highlights the struggles and victories of community organizing against gentrification and displacement, criminalization, and hyper-policing of immigrant communities in Jackson Heights, Elmhurst, and Corona, Queens. 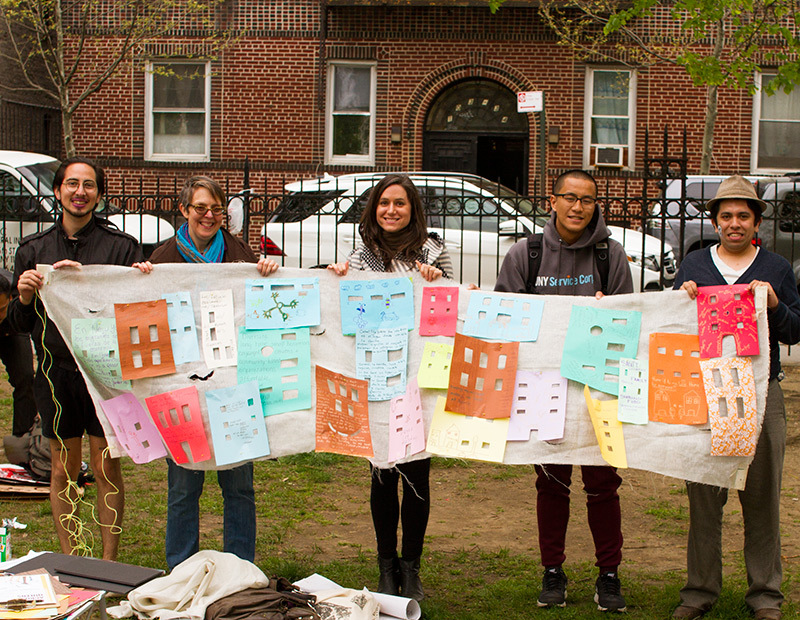 The project aims to support the local organizing movement for housing justice and immigrants’ human rights. Almost Home/Casi Llegando a Casa was developed by Five Boro Story Project’s Bridget Bartolini, Priscilla Stadler, and Milton X. Trujillo, in collaboration with Queens Neighborhoods United, a grassroots organization focusing on three social justice issues crucial for our local community: immigration, gentrification, and policing. This project is generously supported by More Art and Citizens Committee for New York City, and the Puffin Foundation. 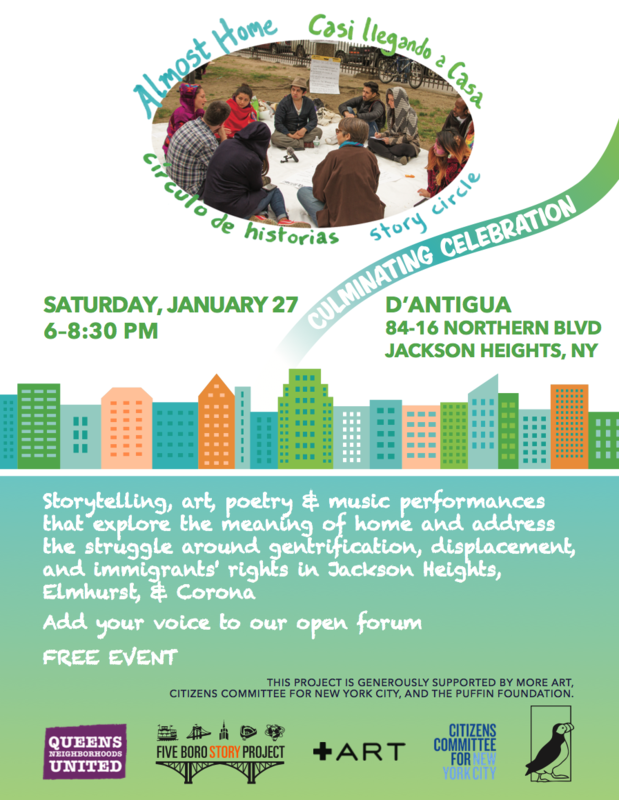 Join us for a story circle to share experiences, listen to each other, and discuss the challenges of staying in our rapidly changing neighborhoods of Jackson Heights, Corona, and Elmhurst, Queens. This is a free workshop, open to all, with yummy refreshments from El Toro Bravo. English-Spanish interpretation will be provided. Manhattan Cocktail Lounge (formerly Tempo Libero) is located at 88-08 Roosevelt Ave, Jackson Heights, New York 11372. Take the 7 train to 90th St – Elmhurst Avenue. View photos from the April 23rd story circle HERE. 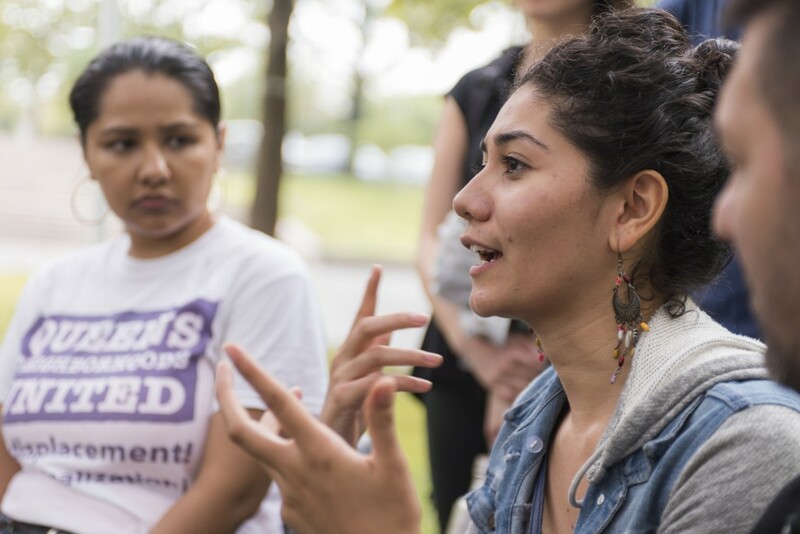 At Queens Se Defiende / Defend Queens, “Almost Home” joins local community and grassroots groups to offer a story-sharing workshop following a presentation by Queens Neighborhoods United and Queens Is Not For Sale. The presentations will begin at 1:30pm, followed by a story circle in the park. Organized by ICE Free Queens in collaboration with Free University of NYC, this is a day of interactive presentations and family activities. Know your rights, make art with your family, and learn more about the general strike happening May 1st. Park of the Americas is located at 41-98 104th St (at the corner of 104th St & 42nd Ave) in Corona, Queens. It is near the 7 train at 103rd St – Corona Plaza. View photos from the April 30th story circle HERE. Tell your story, and get free food from our BBQ! Come enjoy a day in the park, exchange a story for food, meet neighbors, join conversations about our ever-changing neighborhoods, and make your voice part of a collaborative City of Stories installation. BBQ from 12:00-3:00 and Story Circle from 1:30-2:30. Bring the family and a blanket to make yourself comfy in the grass! Take the 7 train to 111th St, walk south on 111th until you pass “Terrace on the Park” entrance. Take next left into parking lot for Zoo. Walk down stairs, we’ll be in the meadow on the right. Look for our Almost Home signs and red balloons! Or take the Q58 bus, walk towards the park from Corona Ave. Enter at parking lot for the Zoo across from 54th and 56th avenues. Look for our Almost Home signs and red balloons! 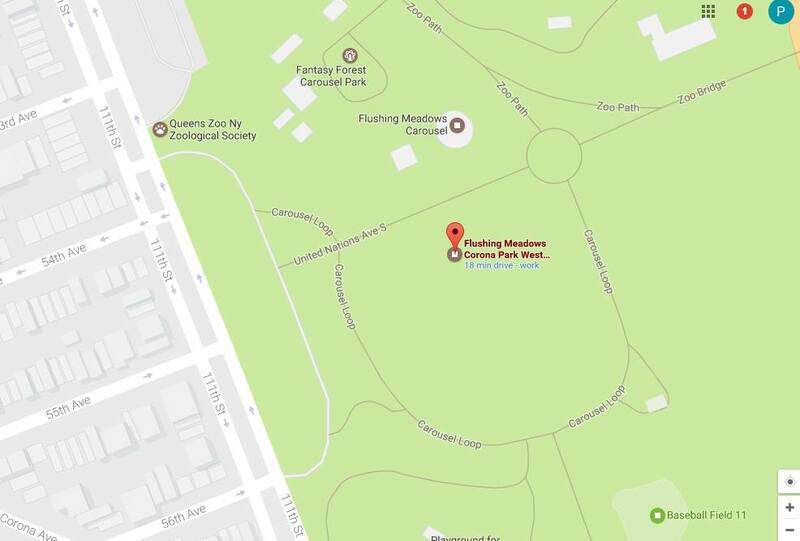 For driving directions please search Flushing Meadows Corona Park West Volleyball and/or Queens Zoo, and use the nearby parking lot at 111th St, across from 54th and 56th Avenues. View photos from the June 17th story circle HERE. 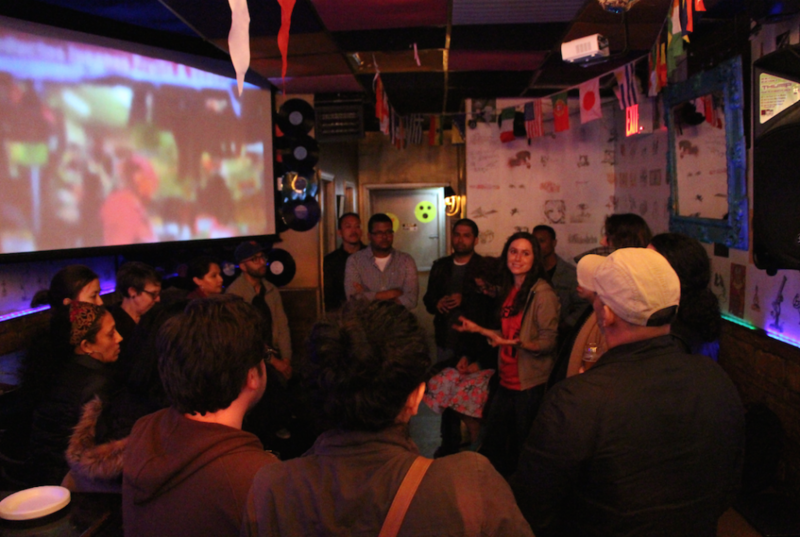 This story circle was held for Queens Neighborhood United members, to reflect on the organization’s past, present and future work in Jackson Heights, Elmhurst, and Corona. The Almost Home/Casi Llegando a Casa culminating celebration features interactive art, and storytelling, music, and poetry performances by notable Jackson Heights, Elmhurst, and Corona residents who will tell powerful stories about gentrification, displacement, immigration, activism and housing justice in our neighborhoods. * Goussy Célestin – Haitian-American, Brooklyn-born, Jackson Heights-based “Renaissance Woman” who interchanges the roles of pianist, composer, vocalist, dancer, and arranger. * Shekar Krishnan – community activist, tenant lawyer, and co-chair of Friends of Diversity Plaza who leads efforts to bring Jackson Heights neighbors together around this unique public space. 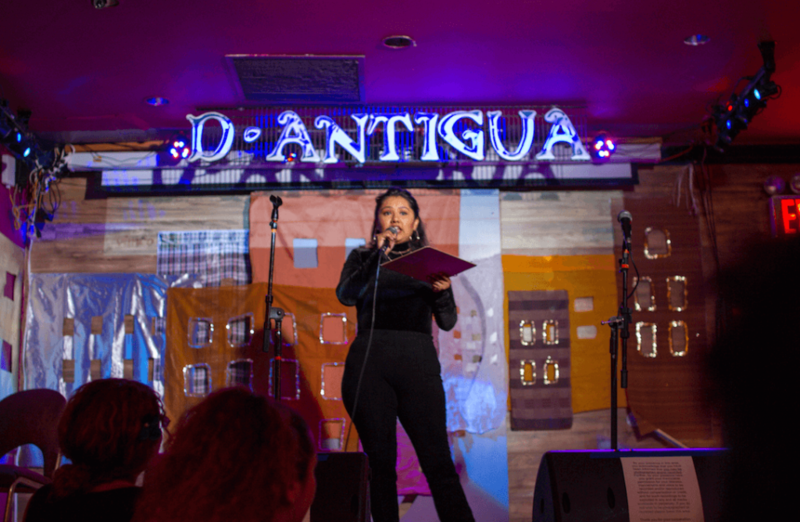 * Yessica Martinez – poet and teaching artist originally from Medellin, Colombia, who has lived in Corona since she migrated to the United States at age ten. * Leticia Ochoa – activist with Queens Neighborhoods United and daughter of a street vendor on Roosevelt Avenue widely known as La Chola Cuencana. * Esneider X – Colombian-born social movement activist, Queens food tour guide, and vocalist in punk band Huasipungo. Following performances by featured artists, add your voice to our open mic! Throughout the event experience a pop-up art “Fragile City” installation by Priscilla Stadler, live painting by Oscar Toro, and a “City of Stories” activity that invites you to collaboratively build a city by adding your own story to a paper building. View photos from the Almost Home Culminating Celebration HERE.